Does your website and/or blog need a new look? Are you frustrated that you are not getting enough traffic to your sites? 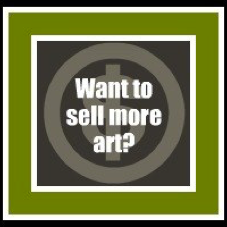 Do you just want to sell more art? For five years I have been offering private art consultations to artists. It’s one of my favorite things to do and I have to be honest with you. It works. I have a 100% satisfaction rate. I have clients that have signed up for four consultations. One of my clients took 33 pages of notes during our ninety minute consultation. What is a Marketing Consultation? If you have been listening to my radio show, "Artists Helping Artists" you will know that I have unlimited ideas and suggestions when it comes to selling art on-line. As an artist myself, I understand what it is like to sell art “in the trenches”. But the difference between my consultations and all of the other marketing offers out there is that this one is all about you. I spend hours studying your website, blog, facebook, etc. and discuss with you all of the things you can do to sell more art. We will discuss new ideas for your website and blog, put together a plan to create marketing materials, get you signed up on instagram, whatever you need! This is your chance for personal one-on-one marketing advice ... with an artist ... who knows exactly (from personal experience) what you need to do to sell more art. Just one marketing session will enable you to identify a marketing strategy and recognize what you should be promoting with your art. We will discuss major changes to your blog and website. These changes will help re-position your work and make it easier for collectors to buy your work. Each consultation is personalized and includes only suggestions that apply to your art, website, blog and social media promotion. We can focus on how to teach workshops. We can focus on how to set up a newsletter. There is no “cookie cutter” approach. We will talk about what you want to talk about. I promise. Each consultation lasts ninety (90) minutes and takes place via phone or skype. Are you wondering if I am qualified to give marketing consultations? Well, for the “fist half” of my life I worked in marketing for 30 years in the “corporate world”. For the last eight years I have developed a love for painting. So I created a blog, website, facebook profile and fan page, created the #1 Art Show on Blog Talk Radio, got my work in to galleries, developed a contact list of almost 8,000, created the Thirty Paintings in 30 Days Challenge, sold images of my art to the largest art licensing company in the world and got my art on the #1 TV show in the U.S., Modern Family. So far, so good. I offer hundreds of free tips every month on my blog talk radio show titled “Artists Helping Artists” and my daily blog "The Everyday Life of a Working Artist". Be sure to listen to past recorded shows on the internet here and click on my blog link above. The 90-minute Art Marketing Consultation is priced at $250.00. This includes all of the time in which I spend examining your website, blog and marketing materials in preparation for the consultation. To sign up for a consultation, just click the Buy Now button. Upon receipt of your payment I will email you a questionnaire to complete and schedule the appointment with you for your consultation. Once you have signed up for your consultation, you will be sent a link to complete an online form with information about you.